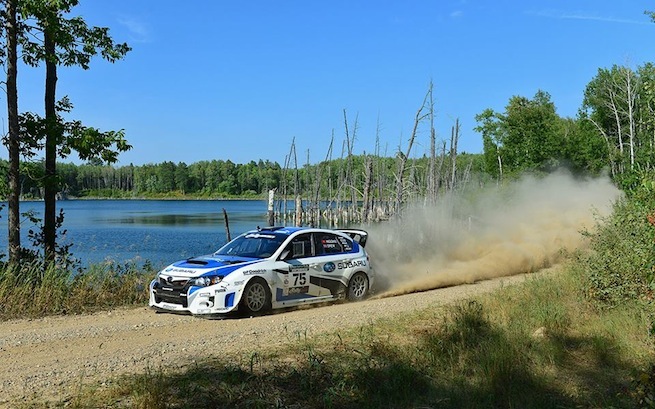 David Higgins overcame extreme adversity this last weekend at the Ojibwe Forests Rally but retains the lead in the Rally America National Championship leading into the final round. Higgins had one of the wildest races of his career last weekend. The first day saw incredible dust that kept the drivers from being able to see the race course. That put the Subaru WRX STI Rally team in second place behind rival Ken Block. If that wasn’t enough, Higgins had to battle through multiple injures but still took home second place overall at Ojibwe. Ken Block who is in second place in the overall standings ran a perfect race and was in first place after day one. But David Higgins and Craig Drew were determined to charge for the win. The team ran two spectator stages with SRT USA #75 and headed back into the forest. They were in the groove and won Stage 9 putting them just 31 seconds behind Ken Block. "We knew after the seeded draw and pre-event shakedown that we were in deep trouble this weekend with the dust, especially in the night stages on day one," explained Higgins. "The plan was to try and stay in touch with Ken Block and keep the pressure there for day two, hoping he would hit trouble. It started off well enough but then things took a bizarre turn." The strong twenty mile per hour wind had dust dissipating quickly so it wasn’t a problem like the previous day. Everything looked good for the Subaru team to stage a comeback. But that’s when the proverbial wheels came off. Stage 10 saw the Subaru WRX STI experience a power steering issue and shortly thereafter something in the road surface snapped the wheel seriously injuring David Higgins' hand. The cars steering was damaged and Higgins had possibly broken his fingers. But the team raced towards the finish but another stage win was out of the question. To add insult to injury, they were working under the hood to try and repair the steering when, Higgins foot was run over by an event medical crew. What could possible happen next? With an injured hand and sore foot, David Higgins still got behind the wheel. But as the team was waiting for the stage start, a tree came crashing down in front of SRT USA #75 blocking the road. They eventually made it back to service but it was clear that it was not meant to be. David and Craig heroically completed the event and with uttermost frustration settled for a 2nd place finish. After the race, Higgins was treated for his injuries. "It was all unbelievable. At least we won the final stage of the rally, which I drove one-handed. It was clear that it was not meant to be though." The showdown for the 2013 Rally America Championship between Subaru’s David Higgins and Ken Block will continue. It all comes down to the last race of the season at the Lake Superior Rally on Oct 18-19 in Houghton, Michigan. Stay tuned for the latest Subaru racing news here at Torque News.